Prior to teeing off at Aviara Golf Club in Carlsbad, the starter informs you that you’re about to enter an 18-hole botanical garden that also happens to be a golf course. The Hyatt resort course more than lives up to those lofty landscape expectations, providing impeccable natural accents to nearly every hole, but especially the par-3s. Aviara gives numerous worthy candidates for a Highlight Hole feature, but I decided on No. 14 because it captures the essence and challenge of Aviara and because it’s a hole you might miss if you go as a spectator for the LPGA tourney. The hole is at the most remote part of the course, but the setting is entirely worth the trip. No. 14 plays up to 190 yards from the blue tees, but it played closer to the white-tee distance of 164 on Sunday. Save for the water on the right, this doesn’t look like a tough tee shot. For one, look at the size of that green. As many greens are at Aviara, it’s spacious, to say the least. But I can tell you from experience, it’s one whale of a putt if you hit the green in a different zip code than the hole. You’re primed for a three-putt. And 190 off the tee is different story than 164. It’s advisable to club up here as I’ve been told it plays long, though I’ve only played it twice. I’ll keep the technicals brief on this one because playing the hole is only half the experience. The green view is stunning. That pond is fed by three waterfalls, which become visible once you reach the green. And then you get an elevated view of the entire water feature when you tee off on No. 15. It’s a magnificent little corner of the course and begins a terrific stretch of holes to the finish that provide a great balance of scenic and score-able, save for perhaps No. 18, the No. 2 handicap hole. I botched 14 by pushing my tee shot right into thick rough near the water. After a tough chip, I two-putted to bogey a hole that played probably as easily as it can play that day. Short tee. Pin away from the water. Reasonable green speed. Oh, well. I look forward to next time and wish you well on your first if you haven’t played here yet. 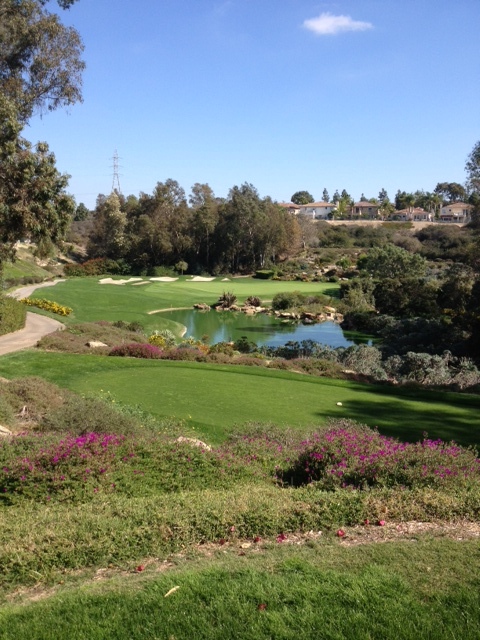 You should always stop to smell the flowers, as the say, when playing golf, but that’s especially true at Aviara. 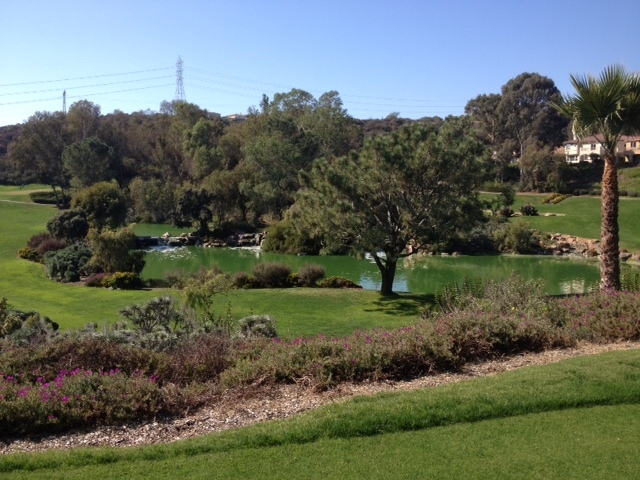 View of the shared water feature from the 15th tee box. This entry was tagged Aviara, botanical, Carlsbad, highlight hole. Bookmark the permalink.